Help find the missing animals! 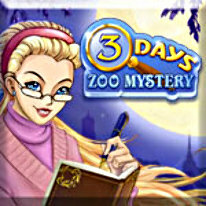 In Three Days: Zoo Mystery, someone's been stealing animals from Anna's family's zoo, including her favorite elephant! ...Man, you gotta have really big pockets to steal an elephant! With only 3 days before federal inspectors are due, Anna's uncle has implored her to help find the missing animals. Search the zoo for hidden objects and clues to help you find the bad guys and recover the missing critters! Can you do it? Find out in Three Days: Zoo Mystery.